We might still be in February but Boatrocker is closing in on double figures for new releases this year – or, at least, new releases and repackaged oldies. And, while there are the sort of barrel-aged beers for which the brewery has become best known among those new releases, there's a focus on hop forward releases too, with the well-received Jeepers Creepers SNEIPA joined by the DDH IIPA. For the most part, we've seen the DDH / TDH abbreviations (double or triple dry-hopped respectively) attached to hazy IPAs. But here you've got a double IPA that's nigh on crystal clear; little wonder the can proclaims it to be "old skool". West Coast-inspired and loaded up with a quintet of US, Aussie and Kiwi hops (Amarillo, Simcoe, Wakatu, Centennial and Enigma), it welcomes you in with stone fruit, pine and a touch of orange before unfurling layers of resinous hop flavours as a slow-building bitterness rises through the slightly sticky body. 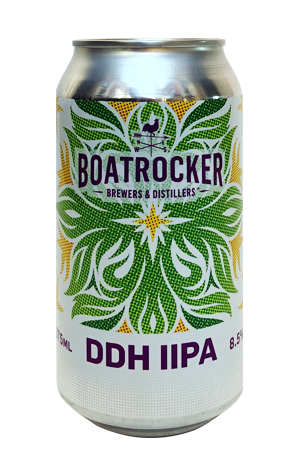 For all the beers to have come bearing the Boatrocker name over the years, it's never really been a brewery you'd think of as an IPA brewery. Much more like this and that may change.